MySQL to MS SQL database converter software works on all latest MySQL server and also provides facility to convert 4.1 or earlier version of MySQL server. Software converts MySQL database and entire or selected table(s) records into MS SQL database in just few minutes. 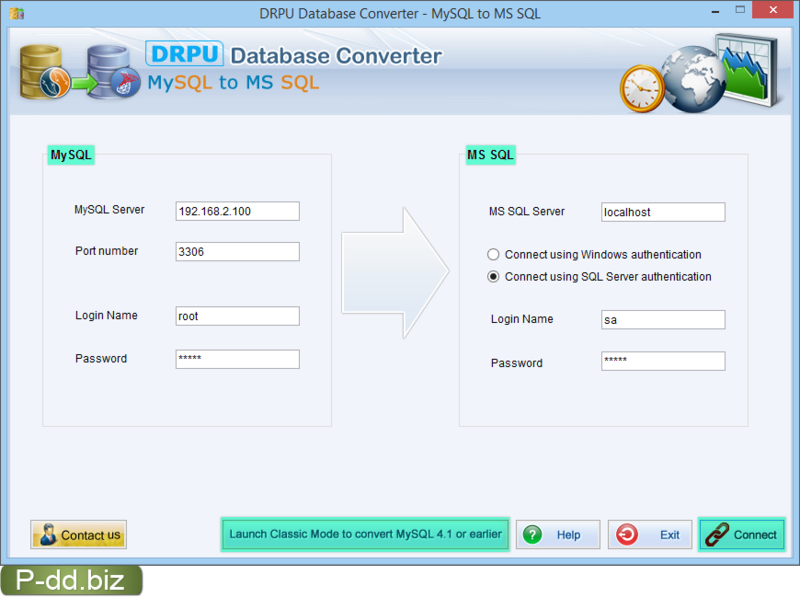 DRPU database converter – MySQL to MS SQL supports all major MySQL data types, indexes, views and other table attributes. Database conversion tool has the ability to choose particular tables to be converted simply by configuring several options in the wizard-like application interface. Data Doctor’s database converter utility allow user to overwrite MySQL database records with existing MS SQL database or saves the converted database records at user specified location for future usage. Enter all required field and press connect button to establish connection between MySQL to MS SQL server. Easily converts MySQL created database records into MS SQL database server in just one click. Database conversion utility fully supports all major data types, attributes, indexes, key constraints etc. Accurately converts database table records without any loss of database information. Provide option to overwrite the converted MySQL database records with existing MS SQL records or saves the converted database records at user specified location. Support all latest version of MySQL database server.